Each year, all the staff and volunteers who instruct roped acitvities have to undergo an assessment/workshop in order to confirm that they are still competent and also to review each of the activities and look at ways in which they may be modified or improved. This year there were two sessions run on tuesday and wednesday night due to the numbers involved. The sessions are carried out by the centre's technical advisor, Steve Spalding, who has helped us for a number of years now. Steve is an MIC-holder who has many years of experience working both at national centres such as Glenmore Lodge and also running his own company, High Expectations, near Pitlochry, and has climbed extensively throughout the UK and abroad. The first session was quite a busy affair - possibly due to a certain minor football game which was being played the following evening in Manchester. As a bonus for the participants, a noisy group of Guides happened to be on site and were found to be ideal 'test-pilots' to use in the session (normally staff have to practice on other staff and tend to be a bit too quiet and well-behaved). Wednesday evening saw another good turnout from those who didn't really care about the football, and again the weather was perfect, if a little chilly. 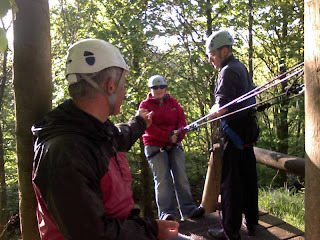 The activities covered were abseiling, crate-climbing and climbing (on the tower). The basic setup of each of these was found to be fine, but Steve gave us a number of suggestions as to how we can modify the rigging and the way in which the sessions are run in order to make it easier for the staff and also more fun for the groups taking part. 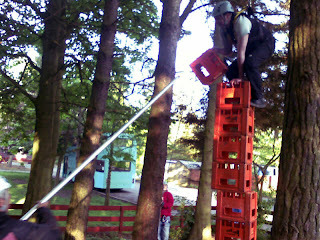 There was a slight feeling of smugness amongst the staff during the crate-climbing session when it transpired that Mr Spalding, although being an immensely experienced climber, was a mere beginner at the wonderful world of crate climbing - although after a few tips from the staff he soon got the hang of it. Although it is a popular activity in the Scout and Guide world, it seems it has yet to catch on elsewhere and it may be a while till it is featured in the various climbing award schemes! It was also suggested that one way of adding a bigger challenge to the crate-climbing (for our regular visitors) would be to do it blindfolded. 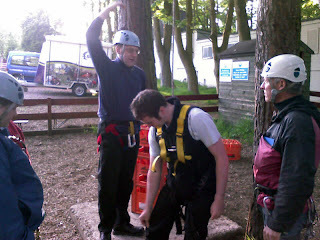 Coco volunteered and declared that it was much more difficult than usual but fun nonetheless (see photo above). 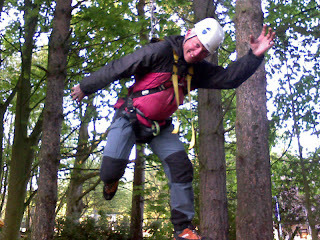 Steve should be coming back again in a few weeks' time in order to assess the other roped activities (Jacob's ladder and zipline) and in the meantime the staff will have the chance to try out their new techniques and ideas on visiting groups as usual.